(Beijing) – The deadly earthquake in the southwestern province of Yunnan has sparked debate on whether the recent surge in seismic activity can be linked to the impact of hydropower projects in the region. As of October 8, at least one person died and another 323 were injured in the earthquake which struck the county of Jinggu in the southern part of Yunnan the previous day, according to state media. The quake’s epicenter was 20 kilometers away from the county and measured 6.6 on the Richter scale. The government has started rescue operations. 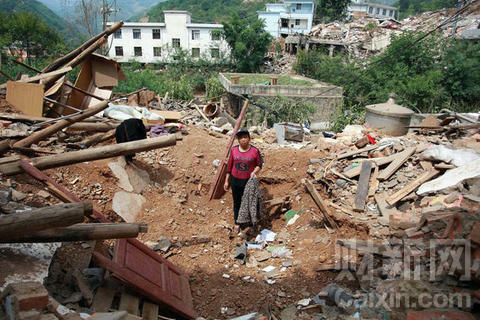 This happened only two months after a similarly strong earthquake hit Ludian, a county about 500 kilometers to the northeast of Jinggu. It killed at least 617 and injured more than 3,000 people. More than 100 are still missing. Pan Huaiwen, director of the China Earthquake Networks Center (CENC), said the two disasters were not linked. But the earthquakes have aroused fears that the seismic activity may have been connected to hydropower construction operations along the Jinsha River, which flows across Yunnan and its northern neighbor of Sichuan Province. Experts say they are worried that many other regions could be prone to earthquakes in coming years with the continued building of hydropower plants. Discussions over whether the Ludian earthquake was triggered by two giant hydropower projects being built in the region have been a hot topic since Nature, a renowned scientific journal, drew public attention to the matter. It published an article in September, citing the research work of Fan Xiao, a Chinese quake expert, which suggested that there was a correlation between the timing of the reservoirs being filled to a rise in seismic activity in the southwestern region. Liu Baojun, a geologist and member of the Chinese Academy of Sciences, is among the experts who say reservoirs can indeed be linked to earthquakes. However, he and many others say they cannot tell whether Fan is right because they do not have enough data. Fan’s research, according the Nature article, also said two smaller earthquakes that hit Yongshan, a county near one of the hydropower projects named Xiluodu were caused by the reservoir. The 13.86 gigawatt capacity of Xiluodu is second only to the Three Gorges dam project in China and ranks the third in the world. [See: Impoundment of two mega–dams on China’s Jinsha River triggers another earthquake in Ludian]. Ma Wentao, a researcher at China Earthquake Administration, agreed with the findings. He said he visited Yongshan in April soon after the first earthquake and concluded the region may be hit again by an even stronger quake because its seismic pressure had built up to the point that the construction of nearby reservoirs could have easily been the last straw, he said. The key of judging whether an earthquake can be linked to a hydropower station is looking at whether small tremors become more frequent when the reservoirs are filled, Ma said. Fan also cited the frequency of small earthquakes as a major indicator in hydropower risk analysis. Before the fatal disaster, Ludian and its surrounding areas were hit several times by earthquakes at or greater than the magnitude of 4 and tremors of a magnitude of 2 or less have occurred more than 400 times, he said. The backwash of concerns comes at a time of hydropower plants being built at an unprecedented scale along the 2,300-kilometer Jinsha River. The central government has announced plans to build 25 hydropower stations on the river with a total installed capacity that is set to be three times larger than the Three Gorges dam project and will account for about half of all electricity output generated in the country’s southwestern region. They include Xiluodu and three other large unfinished projects, all of which are located in the lower reaches of the Jinsha River at or near the border of Yunnan and Sichuan provinces. Among them, Baihetan is poised to surpass Xiluodu with a designed capacity of 14 gigawatts. Whether these hydropower stations would cause earthquakes is a matter that should be closely monitored for many years to come, Fan said. Larger earthquakes triggered by hydropower projects often do not happen until water in the reservoirs has reached its highest limit and sunk into deep underground faults, he said. That is why data on small seismic activities in the region is so important, he said.